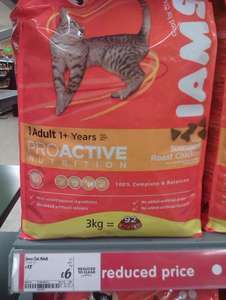 Noticed that Asda (Arnold, Nottingham) have 3kg bags of Iams adult cat food (chicken) reduced to clear at £6 (was £12). Looks like it's an instore deal (maybe even store specific), but thought I'd give you a heads up anyway. They were on display at the end of an isle - strangely enough, near the pet food! Not sure how many bags there were, but the display was totally full at 4pm on Saturday. Great price. Will check out our nearest store on Wednesday and see if they have any. Do adult chickens taste different then?